What Did the Romans Eat? A prosperous Roman town, Herculaneum was lost in the eruption of Vesuvius in 79AD. Rediscovered in the 18th century, its excavation has been particularly challenging. An Oscan town, founded around the site of the cult of Hercules, Herculaneum’s greatest prosperity came after it became a Roman municipum. Like Pompeii, it was lost in 79AD and rediscovered by treasure hunters in the 18th century. It’s excavation has been particularly challenging as it lies underneath the modern town that bears it name. A Brief History of Roman Herculaneum. Herculaneum was conquered by Sulla in 89BC. The town became a part of the Roman state, taking on the status of a municipum or provincial town. The conquest led to the most prosperous phase of town’s history. 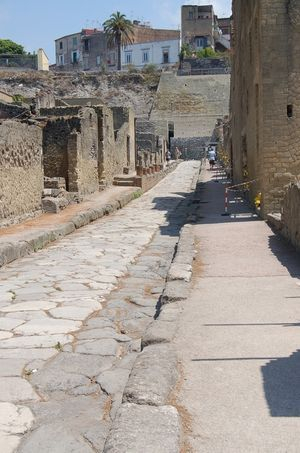 The Romans provided Herculaneum with paved streets, sewers, a theatre and basilica-all the trappings of a Roman town. With its excellent fishing, noted vineyards and breath taking sea views, the town became a tourist hot spot for wealthy Romans looking to escape Rome in the summer months. So important was the town that in 62AD when it sustained damage from an earthquake, its repairs were financed with subsides from the Roman government. Herculaneum’s prosperity was abruptly ended by the eruption of Vesuvius in 79AD. Its destruction was very different to Pompeii. The city was not much affected by the eruption initially, suffering only a light sprinkling of ash. Then at midnight of the 24th August, everything changed. The first of six pyroclastic surges of hot gases and flows left the volcano and headed to Herculaneum. The pryroclastic blast hit the city within four minutes. The velocity of the cloud of hot gases was so great, it lifted statues from their pedestals, leaving their shattered remains some distance away. It also toppled the portico of the palestra and lifted tiles off roofs. The surge was so hot it carbonised wood in the city and caused the sea to boil when it reached the water front. It also asphyxiated the inhabitants. The city was then covered with 20 metres of ash that mixed with water to form mudslides. This slide into the harbour, extending the coastline. The mudslides hardened to form a tufa rock which encased and preserved Herculaneum until its rediscover centuries later. The town was discovered in 1709 when a peasant came across some richly decorated marble debris. Local nobles, alerted by the find, recruited engineers to begin excavating the locality. Their motivation was greed rather than archaeology as they were searching for works of classical art for their palaces. Because of the challenge of the hard tufa covering and the fact that a settlement had grown up directly over the remains, shafts were sunk and the ruins reached via tunnels. The theatre was the first discovery. Many of its walls and friezes were destroyed during this phase of activity as they were knocked down by excavators searching for statues and other decorative objects. However, there was an element of organisation to even this phase of the town’s excavations. Weber and La Vega, two of the first engineers on the site did make sketches and plans of the buildings they encountered before destruction occurred. It was Charles III Spain who was the first to recognise the national importance of the site’s treasures. Although he decorated a whole wing of his palace at Portici with the artwork from Herculaneum, when he left Italy to become king of Spain, he left the treasures behind. Before this, he had stopped the trade in relics. Herculaneum stopped being a source of fine art work and became an archaeological site. After the theatre, the basilica and Villa of the Papyri were discovered and excavated by Weber who again drew detailed plans. But it was not until 1927 that the site began to be excavated on masse. Amedeo Maiuri directed the excavations, uncovering large areas of the town to reveal the port, areas of housing, the baths and the forum. His efforts were only hampered by the fact that large areas remained buried under the modern settlement. Although only a proportion of the city has been revealed, it is sufficient to give a good overview of the character of the town in Roman times. Herculaneum: the excavations, local history and surroundings. Maria Emma Antonietta Pirozzi. Electra Naples. CopyrightNatashaSheldon2010. All photographs (unless otherwise stated) are the property of either myself or Neil Bate and can be used on request. All articles are the intellectual property of Natasha Sheldon and may not be published or reproduced in any print or electronic format without permission of the author.